Let me start by saying I love Milwaukee, and I will never root for the Minnesota Vikings. But I visited Minneapolis for the first time this past week, and must admit I was smitten. Admittedly, it was summer (technically – the weather was definitely Octoberish); I know the winters are even harsher than here along the shores of Lake Michigan. What struck me most was that, despite a lot of similarities to the Cream City, Minneapolis had a much more vibrant feel, reflecting its reputation as a magnet for millenials. The total urban population is similar, the number and type of Fortune 500 companies are similar, the number of major league sports teams, the latitude, the northern European heritage, etc., etc., etc. Why is Minneapolis so hip, and Milwaukee, well….? At the considerable risk of over-reaching based on a 72 hour visit, I would pose that a significant factor is the infrastructure. Specifically for transportation. Minneapolis has light rail, a system of bike paths that resembles Madison on steroids, and robust bike and car sharing programs. Not that Milwaukee isn’t trying. But young professionals simply don’t want to be tied to cars (heck, even an old professional with any sense wouldn’t want to be tied to a car), and in Minneapolis they don’t have to be. The bike trails were mind-blowing. We could park our car when we arrived and not get in it again until it was time to leave town 3 days later. Now, I do love Milwaukee’s Oak Leaf Trail, which basically circumnavigates the county. But it’s hard to get anywhere in the middle. It’s great for recreation (at least the segments that have been maintained – a good bit of work is still needed! ), but limited for commuting. 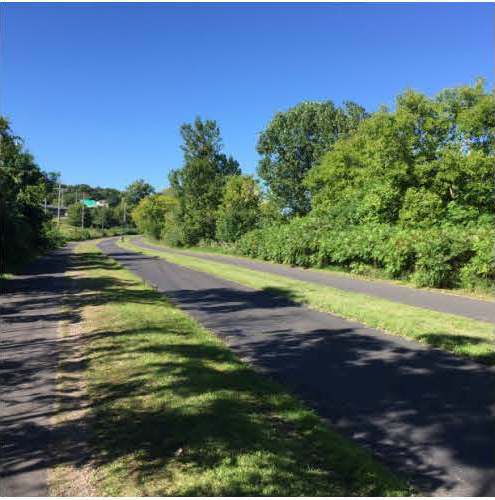 The Hank Aaron State Trail is an increasingly well-used commuter route that essentially parallels I-94, but again, the reach is pretty limited. In Minneapolis, there are trails for both fun and work. One of the paths, clearly meant for commuting, we nicknamed “the superhighway”: 2 bike lanes in each direction, separated by a median, and a separate pedestrian path. That is serious infrastructure! And they clear snow in the winter; people commute by bike year round despite the 50+ days of below-zero temperatures. Not surprisingly, Minneapolis is one of the top-ranked large cities for bicycle commuters (4th of the 70 largest cities, with 3.7% of commuters traveling by bike), while Milwaukee is sadly behind at 26th (1.1%) – just behind Anchorage! It seems likely that this is one factor in Minneapolis’ slightly lower rate of obesity. More striking is that in Minneapolis, 17.1% of residents are considered physically inactive (no exercise in the prior 30 days), compared with 24.4% of Milwaukeeans. Interestingly, there is a strong inverse correlation between the percentage of bicycle commuters and bicycle fatalities. I don’t know whether this is a direct cause (i.e., more cyclists increases familiarity among drivers and makes it safer for the cyclists), or indirect (better infrastructure makes cycling safer and more attractive), but I’ll take Minneapolis’ 40% lower rate of cycling deaths. Oh, Milwaukee, we have better beer, better ball teams, better beaches. It sure would be nice to have better bicycling. Today’s supermarkets in many ways are something out of a 1960s science fiction story. Bar code scanners and payment via cell phone (not to mention the cell phone itself) are just two things that would have seemed a bit far out back when I was watching the original Star Trek. But that’s nothing compared with genetically modified organisms (GMOs), those agricultural products that arise when genes are transferred between species. GMO corn and soy, for example, contain a gene from a bacterium that makes the plant resistant to herbicides. The idea of taking a gene from a soil bacterium and transferring it into a corn plant seems so routine now, it’s hard to remember how mind-blowing it was not too long ago. All of the available evidence (which is considerable but by no means exhaustive at this point) suggests that the products of this genetic engineering themselves pose no harm to human health. That’s good news. But it’s more complicated than that. There remain important ethical and ecological issues. And, as discussed in a recent editorial in the New England Journal of Medicine, there are potential indirect health issues that have not been previously considered. For instance, the “Roundup-ready” GMO corn and soy (which make up the vast majority of those products in the US today) allow farmers to use large amounts of the herbicide glyphosate, which has now been shown to be a likely carcinogen. At the very least, people should be able to choose whether they want to purchase a product that contains GMOs. For myself, I choose not to because I don’t want to support the use of toxic herbicides, or the corporate agriculture system. Others may doubt the evidence of the safety of the products themselves (which for the record I don’t), or may simply be squeamish about moving genes between species. The idea that consumers should be allowed to choose – and need to be informed to be able to do so – is behind the move by several states to require labeling of products that contain GMOs. 64 other countries already do so, including the entire European Union and Brazil, a country with a substantial GMO-based agricultural sector. The US Congress, however, recently passed a law proscribing a federal requirement for such labeling, and also prohibiting state or local governments from enacting any such requirement. This prohibition has been pushed by Big Ag, using the argument that they shouldn’t be required to label products that are shown to be safe. That’s beside the point. We label the fiber content of clothing – no one is claiming cotton or silk are unsafe. It’s just that I should know what a shirt is made of so I can decide which one I want. If something is unsafe we shouldn’t be labeling it, we should be removing it from the shelves. Labeling isn’t about safety, it’s about consumer choice. During those 1960s Star Trek episodes, in the New York area, I frequently saw commercials for Syms, a men’s clothing store. Sy Syms, touting his low prices, would say “An educated consumer is our best customer.” That concept wasn’t too far out then, and it shouldn’t be today. I wish Monsanto and its subsidiary, the House of Representatives, saw it that way. One of the great joys of Wisconsin summer is that it is possible- indeed, desirable – to spend essentially all of one’s time outside. Hence one of our goals for the past week, when my 9-year old twin nieces were visiting from Florida (where the same cannot be said of summer), was to spend as much time as we could in the outdoors. Clean air, exercise, fresh food – perfect antidote to stress, right? Well, it turns out, recent studies have begun to provide an explanation for how it works. Researchers at Stanford found that walking in a quiet natural area produced an elevation in mood, and a decrease in blood flow to an area of the brain associated with brooding and depression, compared with walking in an urban area. Remaining unclear are how long the exposure needs to be (it was 90 minutes in this experiment), and which elements (quiet, greenness, odors, or a combination) are responsible for the effect. It certainly boosts the case for a wellness trail on the medical campus. Numerous studies have shown that moderate exercise leads to long term benefits in terms of stress reduction and improved mood. More recently, English researchers demonstrated that even a 30 minute walk at lunch time produces an immediate increase in energy level and decrease in stress. Some of the most provocative work is in the area of psychoneuroimmunology, which studies the interplay between the microbiome and mental health. Among the intriguing findings are that numerous molecules produced by gut bacteria are psychoactive, and that changes in the intestinal flora are associated with a variety of psychological features including mood, stress, and cognition. They may not have known why, but our mothers were spot on when they told us to get the heck outside and play. On the other hand, right now we’re getting ready to go to State Fair. I’m not sure what cream puffs and deep-fried stick-based foods do to the microbiome, but it can’t be good. We may have to go for a very long walk in the woods to recover. You are currently browsing the Starting With Curious blog archives for August, 2015.